The Bichon Frise is a delightful and adaptable loyal companion. They are extremely affectionate and love to spend their time with their master. The Bichon Frise is originated in the Meditterranean regions of Italy, and Canary Islands. The Bichon Frise is a cross between the Barbet water spaniel and the Poodle. Back to 13th century, the breed was took by Spanish sailor as companions and as barter into Europe. In the 1500s, Henry 3 was a fan of these breed, and carried his Bichon everywhere he went. In the 19th century, it have been a popular organ grinder's dog. The breed was registered with the AKC in 1972. The Bichon Frise is a small dog breeds, but is sturdy, long hair that curls loosely, and strong little body. The Bichon has an alert and keen expression. The coat color of bichon are normally is white color. The breed female are usually is smaller than males. They are non shedding and considered to by hypoallergenic dog breeds. 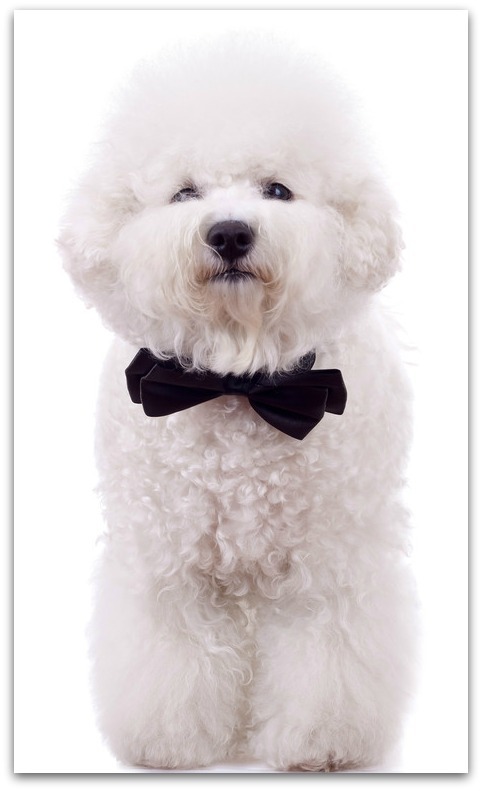 The Bichon Frise is full of energy, lively, animated, sweet tempered and eager. Bichon is highly intelligent and quick to learn tricks, These breeds is extreme affectionate and sensitive, they love to spend their time with their master and master's family. The dog breeds is an intelligent breed, but is may be quite difficult to housetrain. Housetraing can be challenge, dog owner should be patient and consistent while is training that time. Early socialization is important for these breeds. Crate training works best for the Bichon also. The Bichon Frise should be requires frequent grooming and bathed every month, to keep it in shape. The coat should be brushed and combed daily, in order to keep them looking good. Professional grooming is highly recommended every four to six weeks. They are prone to allergies, skin problems, and ear infection. Always keep clean their eyes, ears and important to prevent tooth loss, remember to clean the tooth always. The Bichon Frise is a gentle manner,small little dog breeds. They are extremely affectionate and playful, those owner is seldom less time to accompany them is not suitable to take these breeds home. They are good and friendly with the children and other pets. They are very adaptable, and will be happy in various kind of living environments.